I'm finally finished designing and knitting my very first original knitting pattern! And to celebrate this accomplishment and Friday and Memorial Day and the beginning of summer, I'm giving it away free! If you've been reading my blog for any length of time, you know that I knit and crochet lots of baby blankets. In fact, when I started this blog back in September 2009, my very first post was about a baby blanket I crocheted for my friend Quirk. The post remains one of the most popular ones on PaintingLilies. Since then, I made a blanket for little peanut when I lived in the Dominican Republic. I knitted a tweed baby blanket and a blanket for lil' bit last summer. And I kept warm during my winter in Boston with a modal-ly baby blanket. It seems like my friends can't stop having kids, so I keep on knitting. After finishing up my last blanket in the winter, I started to think that maybe I, too could design a pattern. It couldn't be that hard, right? So I gave it a try. I only made it 2 inches into my first design before scrapping it. I frogged a few other designs before creating the Twin Leaf Baby Blanket pattern. 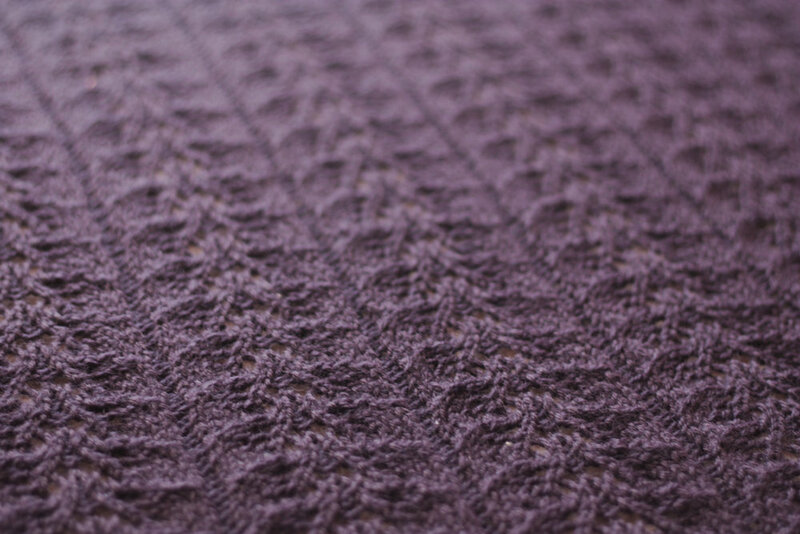 The blanket is knit with an 18-stitch repeating lace pattern. I chose to knit with sport weight wool and size 3.5 needles. (Yes, it takes some time to complete!) You could adjust the gauge and use a thicker yarn and larger needles, but I like the details that you see with this gauge. I mailed the blanket to one of my very good friends from college whose little girl is due in June. She told me her husband was thrilled to receive something that wasn't pink. All you need is an email address to sign up for the Painting Lilies Newsletter. I promise I won't use it for spam. If you sign up, you'll receive occasional emails from me and will have first access to new patterns, discounts and other exciting content. And that's it! You can download the PDF and get started knitting. If you download the pattern, I would love to hear your feedback and see pictures of your completed projects. I proofed it carefully, but please let me know if you find any errors so I can correct them. The project details can also be found on Ravelry.